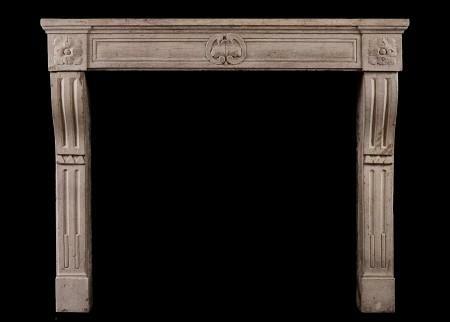 An 18th century French Louis XVI limestone fireplace. 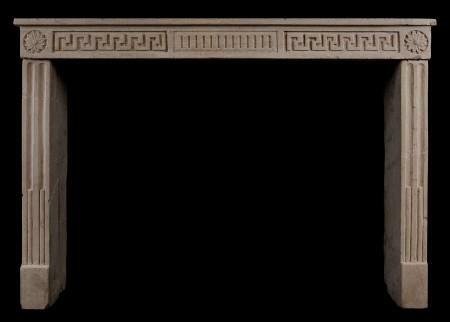 The frieze with fluting to centre panel, flanked by Greek key pattern and carved rosettes. Stop-fluted jambs below. An attractive piece. 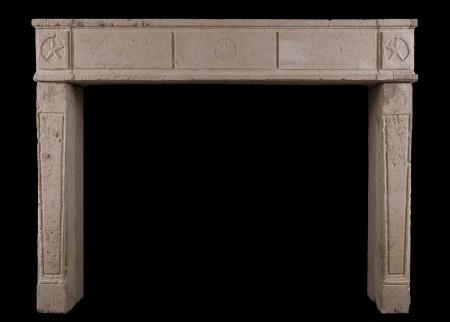 A quality 18th century French Louis XVI limestone fireplace. The fluted jambs surmounted by carved end blocking with rosette. The panelled frieze with carved shell to centre. Breakfront shelf. A period, rustic piece in good condition. 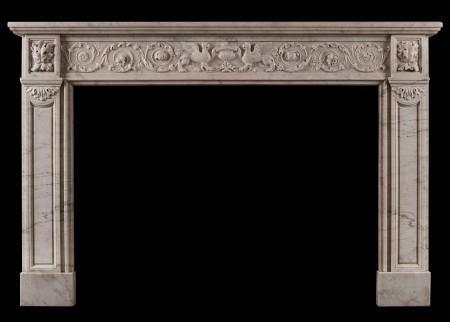 A finely carved French Louis XVI limestone fireplace. The delicately carved frieze with foliage to centre panel flanked by diamond motif with rosette to centre, and end blocks of floral paterae. The jambs with leaves and foliage. 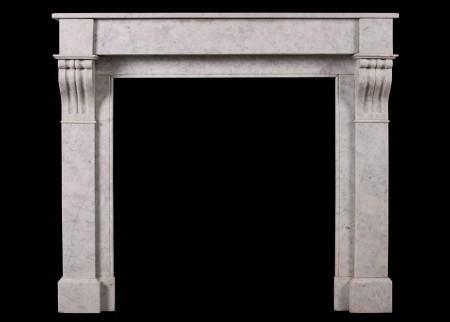 Directoire period with an Egyptian influence. Early 19th century. 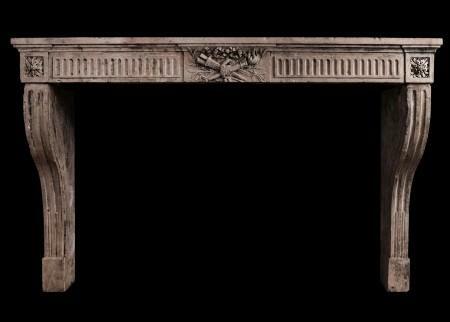 A rustic yet charming French Louis XVI stone fireplace. The delicately carved frieze and jambs with foliage throughout. Directoire period, early 19th century. Small scale, well suited for a bedroom or study. 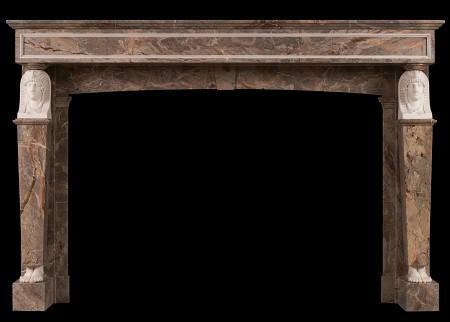 A rustic and substantial Caen stone fireplace. The solid, panelled jambs surmounted by frieze with star motifs throughout. Rustic feel throughout, not overly restored. French, 18th century. 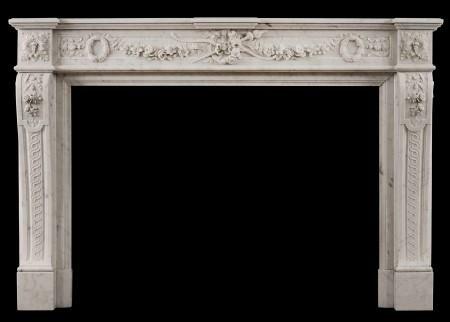 A fine quality Louis XVI style fireplace in Italian Carrara marble. 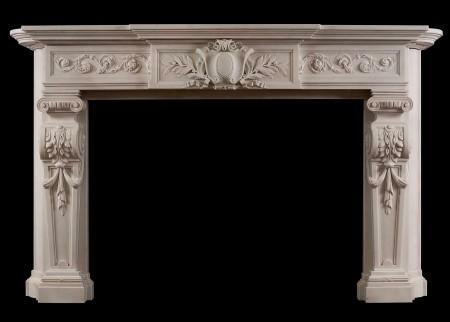 The shaped jambs with carved acanthus leaves and scrollwork, surmounted by carved square paterae. The shaped, frieze with foliage, bellflowers and fine leaf work throughout. Panelled outgrounds. French, 19th century. 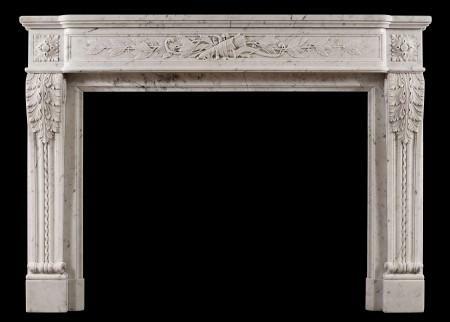 A 19th century French Louis XVI style fireplace in Carrara marble. 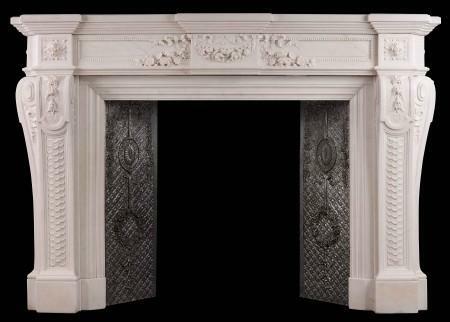 The moulded jambs with attractive acanthus leaves and scrolled returns, the frieze with carved oval paterae, moulded panels and square paterae to side blockings. Breakfront shelf. 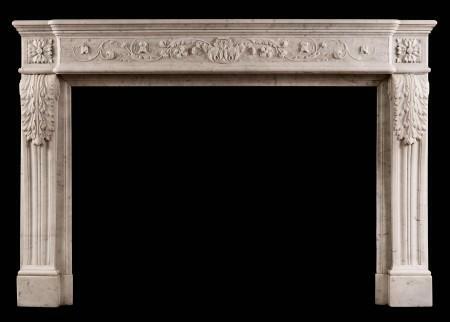 A French Louis XVI style Carrara marble fireplace. The frieze with carved foliage and swirling paterae throughout, with winged beasts and urn to centre. The jambs with shaped panel surmounted by end blocking with carved oak leaves. Plain moulded shelf above. 19th century. 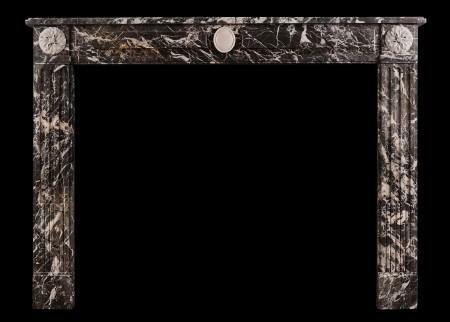 An unusually tall French marble fireplace in the Louis XVI manner. The elegant jambs with tapering, fluted columns surmounted by carved capitals, the frieze with fluting throughout surmounted by moulded shelf above. 19th century. 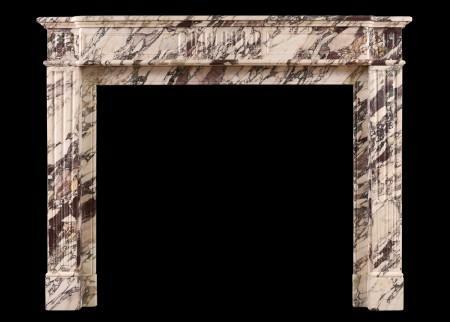 A Louis XVI style fireplace in rich Breche Violette marble. 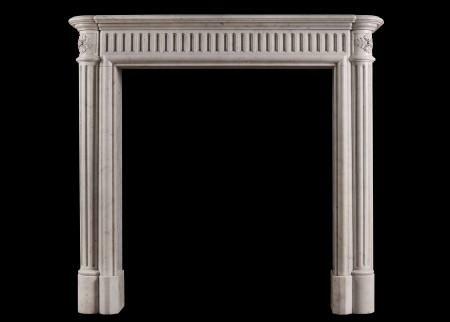 The jambs with tapering fluting throughout, surmounted by shaped frieze with stop-fluted centre panel. Shaped, moulded shelf above. 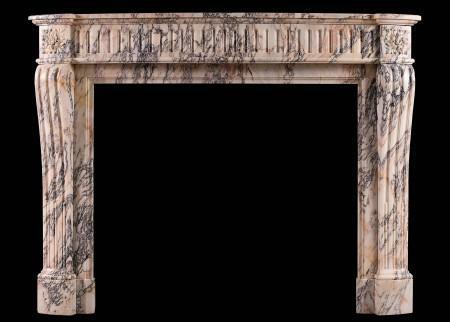 Very fine, rare marble, with an even distribution of veining across the piece. French, 19th century. 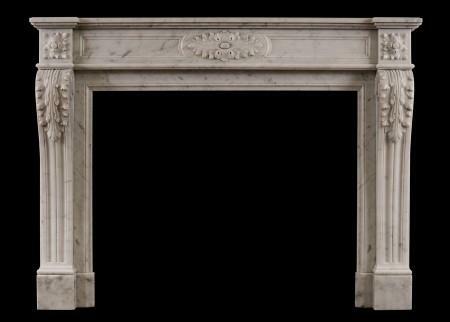 A 19th century French Louis XVI style Carrara marble fireplace. The panelled frieze with torch and quiver to centre, carved wreaths and draped flowers. The scrolled jambs with tied ribbons and foliage with guilloche motif below. The end blocks with carved paterae or floral form. Panelled outgrounds. Moulded, breakfronted shelf. 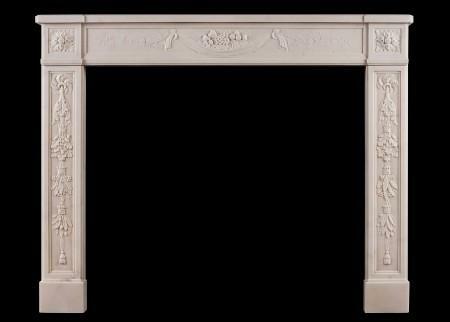 A mid 19th century French Louis XVI style Carrara marble fireplace, with panelled frieze delicately carved with quiver, arrow and foliage. The shaped jambs with acanthus leaves, rope moulding and square paterae above. Panelled returns. Moulded shelf. 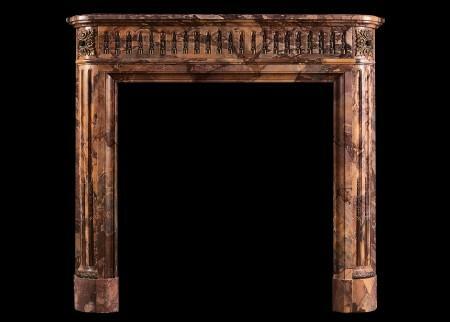 A French Louis XVI style fireplace in veined brown marble. The stop fluted jambs surmounted by carved swirling paterae to end blocks. Panelled frieze surmounted by moulded shelf. A copy of an 18th century original. 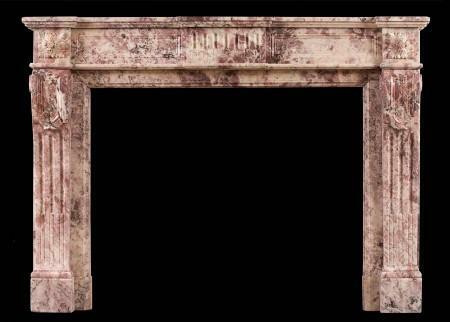 An 18th century French Louis XVI Statuary marble fireplace. The carved frieze with arrangement of fruit and drapery to centre, flanked by finely carved foliage. The jambs with tied foliage and berries, surmounted by carved square paterae. Moulded shelf above. Very fine quality carving. 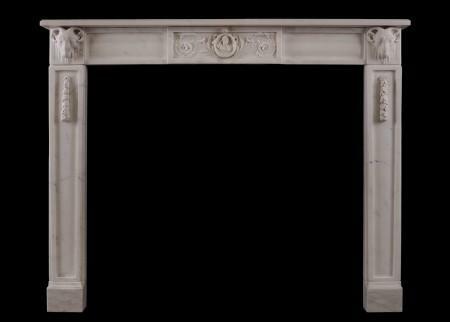 A 19th century white marble fireplace. The jambs and frieze with carved leafwork and berries throughout and carved cartouche to centre. Moulded shelf above. A 19th century French Carrara marble fireplace in the Louis XVI style. The shaped, fluted jambs with carved inlaid husks, surmounted by carved square paterae. 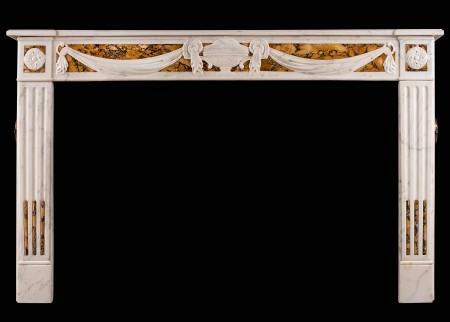 The panelled frieze with matching inlaid flutes. Bowfronted moulded shelf. 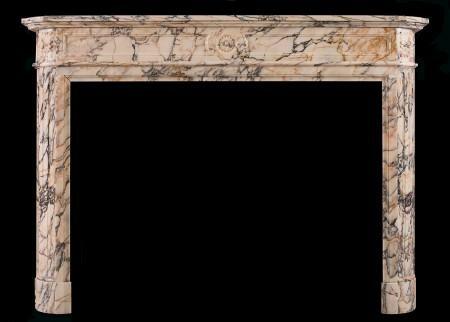 An attractive petite period Louis XVI stone fireplace. The shaped jambs with stop flutes to base, the panelled frieze with cartouche to centre with carved square rosette end blocks. Moulded shelf above. A rustic piece from a wine house in Beaune. 18th century. 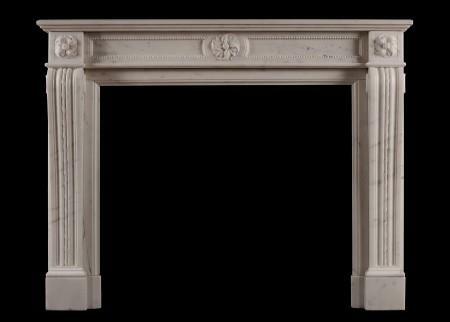 A 19th century French Louis XVI style demi lune fireplace in Breche Violette marble. 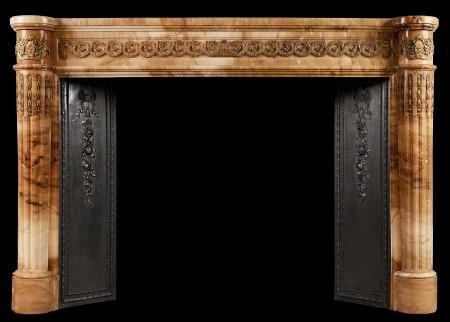 The shaped, fluted legs with carved paterae above, the panelled frieze with carved rosette to centre. Shaped moulded shelf. An ornate French Statuary marble fireplace in the Louis XVI style. The panelled jambs with cascading swags surmounted by brackets carved with acanthus leaves and swirling paterae, surmounted by ionic capitals. 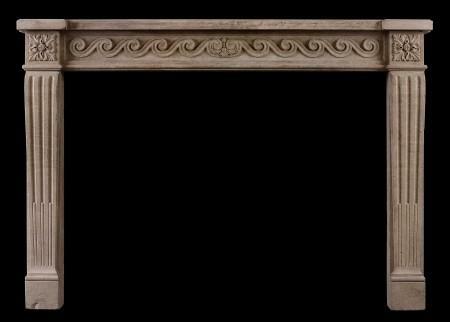 The panelled frieze with delicately carved foliage with centre blocking with leaves, cartouche and beaded oval plaque. Breakfront moulded shelf above. French, 19th century. An imposing piece. 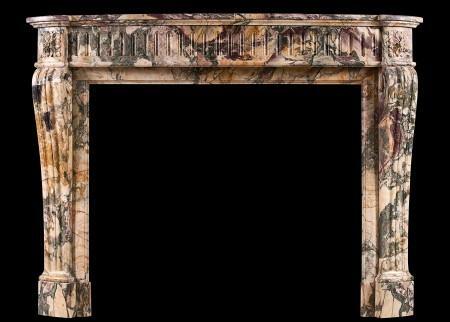 A 19th century French Louis XVI style Breche Violette marble fireplace. The shaped, scrolled jambs with carved square paterae above. The bowed frieze with flutes throughout and shaped, moulded shelf above. 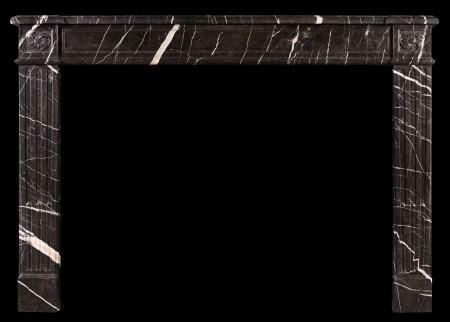 Very striking marble. 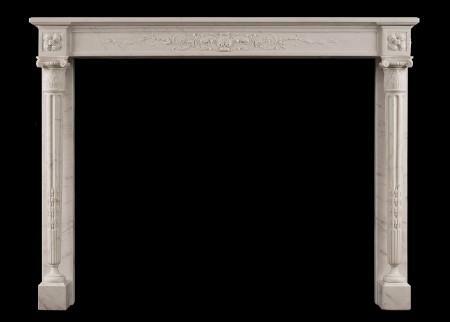 A French Louis XVI style fireplace in attractive Fleur de Pecher marble. 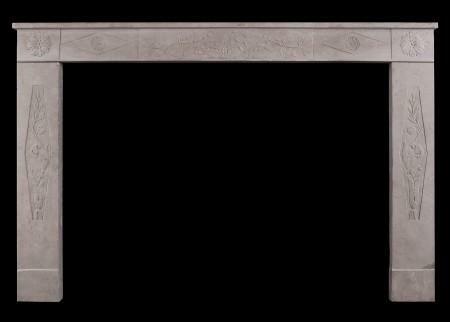 The panelled frieze with stop fluted centre, carved square paterae surmounted by breakfront shelf. The shaped bracketed jambs with panels and flutes. Translated as Peach Tree Flower, Fior di Pesco is an Italian marble from the Carrara region, named so as the pattern can resemble the shape of flowers. 19th century. 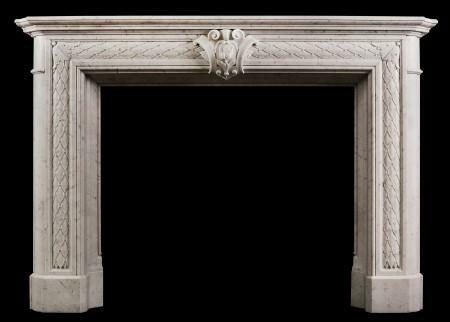 A 19th century French Louis XVI antique fireplace in veined Statuary and Italian Siena marble. The carved frieze with Neo-Classical urn to centre, flanked by drapery. The inlaid stop-fluted jambs surmounted by carved round paterae to end blockings. Brass vents to outgrounds. 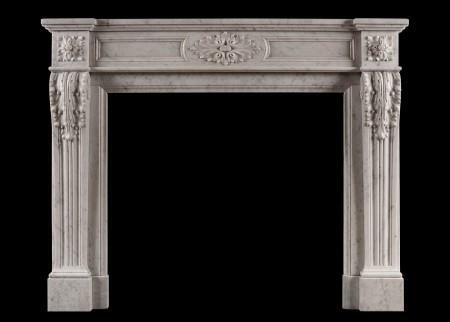 A French Louis XVI style fireplace in Carrara marble. The moulded jambs with acanthus leaves and scrolled returns, the frieze with carved oval paterae, moulded panels and square paterae to side blockings. Breakfront shelf. 19th century. Smaller scale than average. Some mild rust spots to left hand outground. 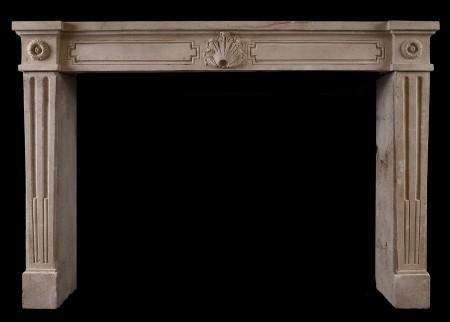 A good quality period French Louis XVI fireplace. The shaped, stop-fluted jambs surmounted by square carved paterae. The frieze with panels and fluting, with centre tablet featuring carved torches and ribbons. Moulded shelf above. 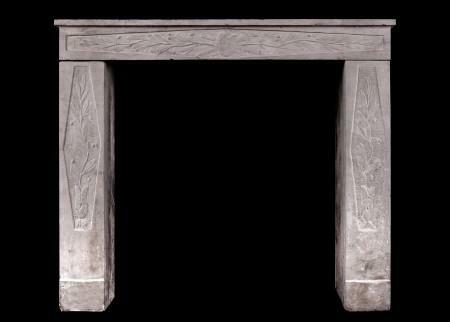 An imposing, substantial piece perfectly fitted for a rustic setting. 18th century, with later adaptations.